OOS International supports various social projects contributing science and education to develop a sustainable society. 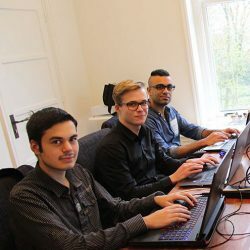 The company places high priority in its social activities on educational support by adding value to students of HZ University of Applied Sciences in Zeeland, the Netherlands through business projects. This month eight young IT talents of the future started building an effective e-learning environment, a new course management system for OOS International to optimize the existing certificated course process. This assignment allows students to verify their theoretical knowledge and gain important practical experience on IT and the offshore industry. OOS International is convinced that the cooperation between higher education and business provides both students and companies continuously improvement and growth. The business project is expected to be finalized by mid-January 2017. OOS International wishes the students an educational experience and all the best in this project.